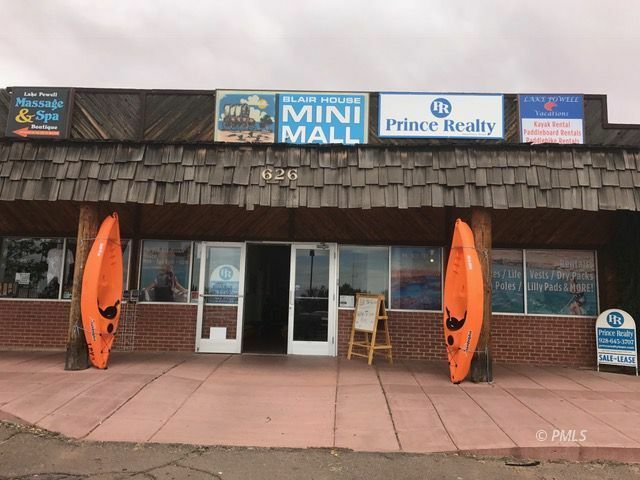 This free standing prime custom built building is located in the heart of downtown Page. It was designed to house the famous Blair Dinnebito Trading Post which it has for 30 years. It has featured Native American jewellery,arts and crafts to clothing and food. Original hand crafted items for sale to the local and tourist trade and providing raw materials to the artists has made the location a popular destination. This commercial retail space is now being offered for your consideration in any venue that you can envision. It is 7900 sq ft with the attached two story building approximately 3950 sq ft. The ground level space faces the large parking lot and has windows that run the length of the building. Double doors open onto the sidewalk are to accommodate the browsing foot traffic. The east side of the building opens onto the beautified breezeway providing with separate office space which is available for individual businesses and can be used for income property. An alley runs along the back of the building for the unloading of merchandise. This property offers a lot. Two new Business's have moved in. Come take a look for yourself! Call for an appointment today.